Thankfully, Amber is still ahead of school hours compared to this time last year, even with the time off for her confirmation and preparation. Next week we are back to full schedule, assuming Amber doesn't get as sick as I've been. Amber worked on some math, but it taxed her brain too much and made her sickly the rest of the day. She worked on quite a bit of her co-op Bible class homework, which is ironically a class run by one of the pastors that confirmed her. And lastly, homework for the co-op classes that I teach. I did say she eased back in. 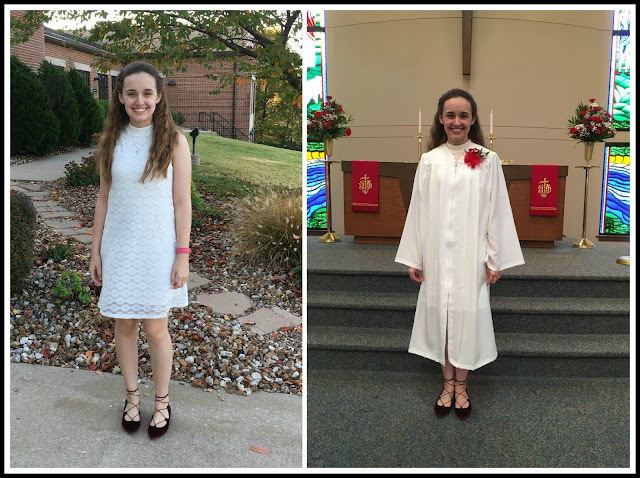 Amber's confirmation at church, then the party at our house. Halloween: Amber rested as much of the day as possible, while we had a service guy out to repair the dryer. The repair didn't happen because of cost, and a new one was ordered. Then, a friend came over to watch movies and do a little trick-or-treating. No.. not Mary Poppins, as every single house asked. Missy from Doctor Who. Sick kitty (Rosetta) to the vet for a quick check. I thought it was just her first cold, but the vet wasn't sure because of some symptoms. Rosetta got an antibiotic shot to boost her immune system, after almost two hours at the vet. Flute lesson, shopping, and preparing food for lunch as the culmination of our nutrition unit in health class at co-op. I really do go all out sometimes when less would be sufficient. 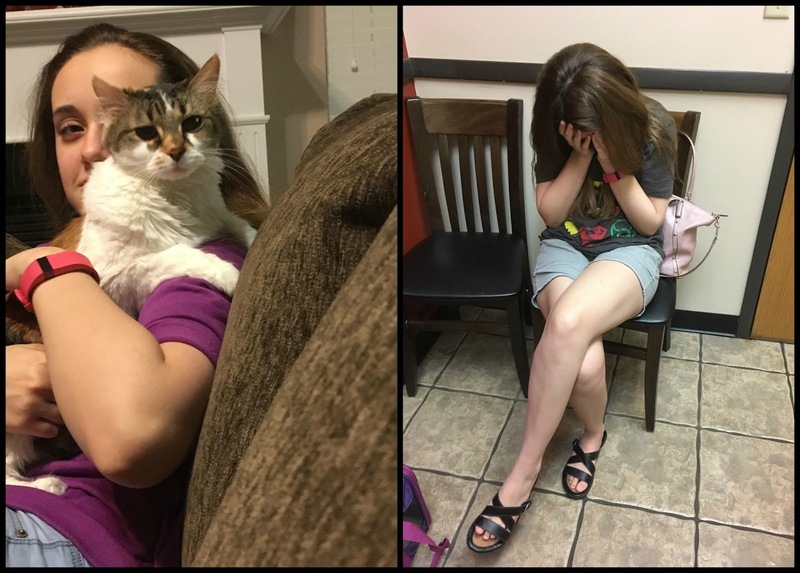 Sick kitty and silly girl... it's how we pass the time waiting, and waiting at the vet. Co-op classes... at least I didn't have to pack our lunches. Registration for next semester starts in a week. I'm insane and still teaching three classes (including a lab science class) and allowing Amber to take five classes (including that lab science class). Oh well. Everything she's taking counts toward needed high school credits. New dryer delivery & Amber's physical therapy. Yes, the two hour delivery window put the only two things for the day at the same time. Fred rescued me from my inept scheduling again and took Amber to physical therapy. The dryer delivery went poorly due to the sales person's great desire to sell me a dryer. The dryer did not, as promised, fit my four-year old pedestal of the same brand. So now I have a new pedestal coming Monday. The sales guy knew I'd go with a different brand and store if I had to get a new pedestal. So he and his company are on my personal do-not-use list. This means the dryer pedestal will probably have a two hour delivery window during the regular PT time on Monday. I just can't win. I am grateful for my family who put up with my distress today and took me out to dinner after it was all over. Fred really saved the day by taking Amber to PT though. I was able to deal with the delivery and subsequent problems, and still had time to run up to the urgent care for my cold that nearly went away (I was almost ready to say it was gone) and instead continued on as a sinus infection. One last confirmation day picture. I had to call Amber inside from her party fun outside for the picture. That's it for today. I'm planning school lessons this weekend, and of course doing two weeks worth of laundry. Fun times, but almost restful. P.S. If you were considering joining the Homeschool Review Crew, the application is still open! Take a peek at what's needed. What a bummer about the dryer pedestal. I hope my dryer doesn't die with just 4 years of use. It is almost three years old already. I love the confirmation pictures. Congrats Amber! 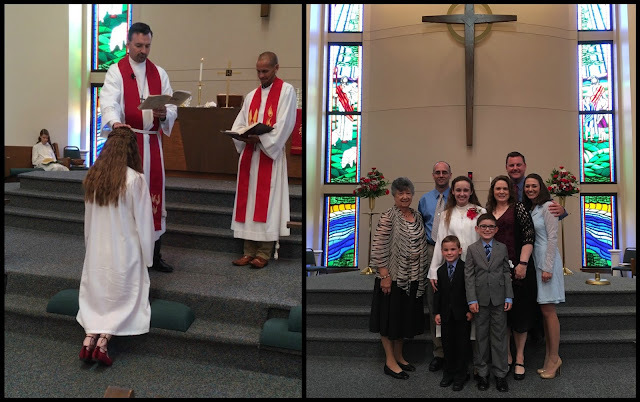 Congratulations to Amber on her confirmation! But so sorry that she had a difficult week health-wise. 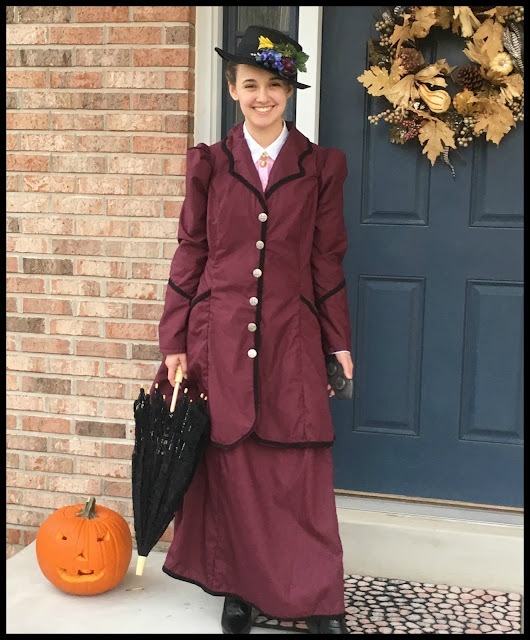 I can see how people might assume she was Mary Poppins - the costume is fantastic!! Thanks for linking up at Homeschool Highlights! I love seeing what everyone is working on week to week.